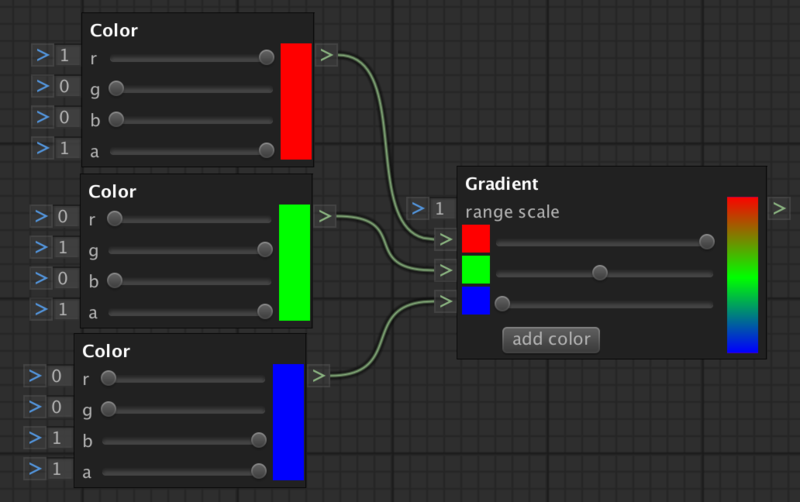 The GradientNode can be used to create color gradients. It uses the y coordinate of the request socket for the color lookup. E.g. use this node to color your height maps. add color Adds a new color socket as a component for the gradient. Up to 8 colors are allowed due to the limitation of the Gradient class. x Removes a color component socket that is not connected. slider Moves the position of a color component in the gradient. range scale Multiplies the color lookup by this number. It uses the y coordinate of the request between [-1, 1]. E.g. use other scales than 1 if you also scaled a height map that uses this gradient. color A color component for the gradient. color The color at the request y coordinate. It uses the y coordinate of the request between [-1, 1] that can be scaled using 'range scale'.